THURSDAY, July 30, 2015 (HealthDay News) -- Certain types of exercise improve bone health in middle-aged men with low bone mass and may lower their risk for osteoporosis, according to a small new study. Men naturally lose bone mass as they age, which can put them at risk for osteoporosis, a condition that weakens bones and makes them more likely to break. About 16 million American men have low bone mass, and nearly 2 million have osteoporosis. The new study included 38 healthy, physically active middle-aged men with low bone mass who followed a weight-lifting or jumping program for a year. In both exercise regimens, the men did 60 to 120 minutes of targeted workouts a week. The men also took calcium and vitamin D supplements. Their bone health was assessed at the start of the study and again at six and 12 months. Both groups had significant increases in the bone mass of the whole body and lumbar spine at six months, and this increase was maintained at 12 months. Only those who did weight-lifting had increases in hip-bone density, the study found. "Weight-lifting programs exist to increase muscular strength, but less research has examined what happens to bones during these types of exercises," Pam Hinton, director of nutritional sciences graduate studies in the department of nutrition and exercise physiology at the University of Missouri-Columbia, said in a university news release. "Our study is the first to show that exercise-based interventions work to increase bone density in middle-aged men with low bone mass who are otherwise healthy. 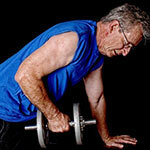 These exercises could be prescribed to reverse bone loss associated with aging," she added. However, Hinton pointed out that the findings do not prove that all kinds of weight-lifting will boost bone mass. "Only the bone experiencing the mechanical load is going to get stronger, so we specifically chose exercises that would load the hip and the spine, which is why we had participants do squats, deadlifts, lunges and the overhead press," Hinton said. "Also, the intensity of the loading needs to increase over time to build strength. Both of the training programs gradually increased in intensity, and our participants also had rest weeks. Bones need to rest to continue to maximize the response," she added. "The interventions we studied are effective, safe and take 60 to 120 minutes per week to complete, which is feasible for most people. Also, the exercises can be done at home and require minimal exercise equipment, which adds to the ease of implementing and continuing these interventions," she explained.